When you think about a spreadable chocolate product, you probably think of Nutella, the popular chocolate hazelnut spread that originated in Italy over 50 years ago. But Nutella isn’t the only chocolate spread on the market anymore, as quite a few brands are coming out with their own versions of the tasty treat. Hershey’s is the latest company to release a line of creamy, spreadable chocolate products and it makes sense to see something like this coming from a chocolate maker. Hershey’s Spreads are available in Chocolate, Chocolate with Almonds and Chocolate with Hazelnuts. Naturally, I had to try them all to see which one was the most delicious. 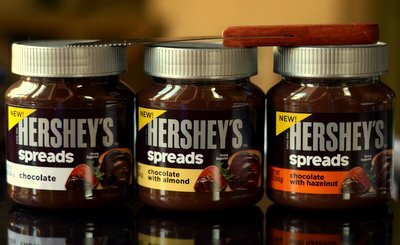 Hershey’s Chocolate Spread is the cornerstone of the Spreads line. This spread tastes like a strong, rich hot chocolate – only with the consistency of an ultra-creamy peanut butter. It has a strong cocoa flavor and, although there is some nonfat milk listed in the ingredients, it has a more bittersweet cocoa flavor that makes it taste more like dark chocolate than milk chocolate. It has a relatively short ingredient list and is primarily made with sugar, vegetable oil, nonfat milk and cocoa powder. You could stir it right into a bowl of vanilla ice cream for a great chocolate swirl. Hershey’s Chocolate with Almonds Spread is very slightly thicker than the Chocolate spread, but still has the same ultra-creamy consistency. It smells like roasted almonds and cocoa when you open the jar, and you can really taste the toasted almonds in every bite of the spread. Chocolate and almonds go extremely well together, and this spread has close to a perfect balance of both flavors where neither is overwhelmed by the other. 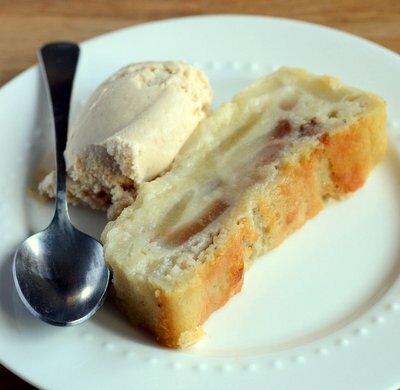 It is sweet, but the strong toasted almond flavor tempers it a little bit. This one is especially good when topped with a sprinkle of sea salt to highlight its nuttiness. Hershey’s Chocolate with Hazelnuts Spread is the spread that Nutella fans will most likely want to try first – and I suspect that they won’t be disappointed because this spread hits the mark in terms of both flavor and texture. It is creamy and smooth, and has a strong hazelnut flavor. Unlike the almond spread, where the nuts really stand out, the hazelnuts blend seamlessly with the chocolate to create a flavor profile that is very cohesive and very addictive. This spread would be good on just about anything, from toast to toasted marshmallows. With so many more chocolate spread options out there, that only means one thing: I have a lot more flavors to work withÂ from here on outÂ as I come up with new recipes that use chocolate spreads. Disclosure: I have been compensated by The Hershey Company to promote its Hershey’s Spread products, but any and all opinions expressed are my own. Do they sell it overseas? In Sweden for example? 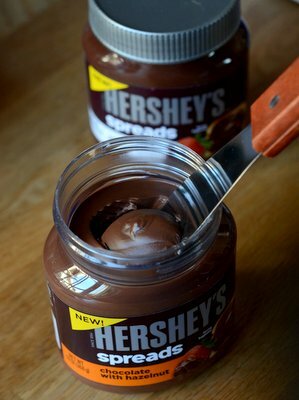 Is this Hershey’s alternative cheaper than Nutella? Madelein – I actually don’t know, but since the product is very new here in the US, I am going to go out on a limb and say it is probably not available in stores in Sweden. That said, I have seen it for sale online, so you might be able to order it. Sandra – In my area, the two are pretty comparable at most stores, with Nutella being slightly more expensive and slightly less likely to be on sale. I’ve seen the Hershey’s for less than $4 for a 13-oz jar. Have you looked at the ingredients, fat, sugar? They use cheap bad oils. Sugar 1st ingredient, still not good for our children or adults. I saw you said Hershey’s paid you, please let your followers know the bad as well as the good. 21 grams of sugar in 2 tablespoons! For a homemade alternative that is still indulgent, you might want to check out my homemade Chocolate Almond Spread! I cannot find a list of ingredients of this product anywhere!!!! I want to know what’s in it…. I have been getting quite a few comments from European readers. The Nutella that they sell in the US is different from the Nutella available in the UK (most US stuff is produced in Canada, from what I can tell based on the product labeling in stores), so there may be a great difference when you compare Hershey’s Spreads to European Nutella, which I generally find to be very different in flavor and consistency that US Nutella. The ingredients in the Hazelnut spread are: SUGAR, VEGETABLE OIL, NONfAT MILK, HAZELNUTS, COCOA (DUTCH PROCESS), CONTAINS 2% OR LESS OF: HYDROGENATED VEGETABLE OIL (PALM AND CANOLA OIL), SOY LECITHIN, SALT, NATURAL VANILLA FLAVOR. For comparison, the ingredients for US Nutella are: SUGAR, PALM OIL, HAZELNUTS, COCOA, SKIM MILK, REDUCED MINERALS WHEY (MILK), LECITHIN AS EMULSIFIER (SOY), VANILLIN: AN ARTIFICIAL FLAVOR. The almond spread uses almonds instead of hazelnuts and the plain chocolate spread uses no nuts and contains both dutch process and regular cocoa powders. All of the Hershey’s products use natural vanilla. I don’t care AT ALL for Nutella due to it’s sickeningly sweet taste. The Hershey’s Spread was on sale at my local grocery store for $3.00, and I had a coupon for $1.50 so I really couldn’t pass up the opportunity to try it. I have not yet done so, but I am really hoping it’s not a disappointment like Nutella was! I don’t like hazelnuts, but love almonds. Had to find an alternative to peanuts which I became allergic to. The Hersheys’ Chocolate/Almond is great on a large Gala apple, but use just 1 teaspoon instead of 1 tablespoon. You get apple crunch, mouth creamy, sweet from both w/o being sickening. Not that interesting on a banana. Can you suggest other alternatives for using it besides toast/english muffin, etc? Their website is only geared to twitter, instagram, etc. I don’t use any of those. Just tried.this……I love chocolate and I.warmed.some.in.the.microwave and.dippped strawberries.in.it…..it is like chocolate crack….I love it. You can make your own and it tastes sooooo much better. 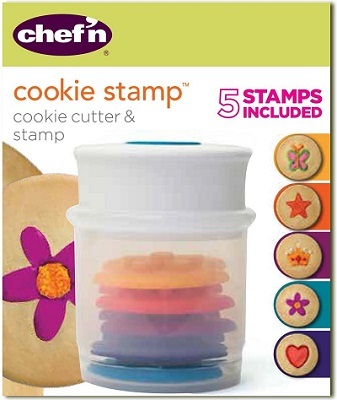 Check out recipes online . I buy almonds in bulk and make my own. I don’t buy anything containing palm oil. I’m wondering how well it holds up in a heated fondue pot….